During our spare time, we play Divergent Thinking games. Divergent thinking games incite the imaginative and spontaneous aspects of our minds. These traits correspond to the games themselves as ell as real life situations. We have compiled a list of our favorite games along with how to play them. Next time you see us at a competition, start up a game with us! "Association, Disassociation" begins when a player says a random word. The next player names something that associates with the last word said. When you hear something that starts with a vowel, you change to disassociation and say something that has nothing to do with the last word said. If you hear another word that starts with a vowel, you switch back to association. 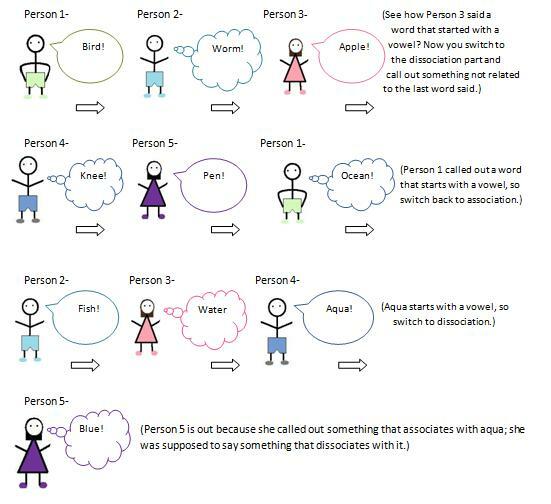 A player is out if they associate when disassociating and vice versa. The game is continued until there is one player left. This game exercises the players ability to Listen with Understanding and Empathy. We had the chance to work with Roboticist Tomotaka Takahashi, creator of the Volta Robot, and his team from Japan in the Evolta World Challenge I: Hawaii Triathlon, held here in Kona. The Evolta World Challenge is a yearly challenge that Takahashi takes on, building robots powered by Panasonic batteries. This partnership began the Evolta challenge. During each challenge, the robot must complete a challenge using the same three batteries throughout the entire race. If the batteries run out of charge, the robot must stop and recharge. These challenged proc the power of Panasonic batteries and bring publicity to Mr. Takahashi and his robot Evolta. 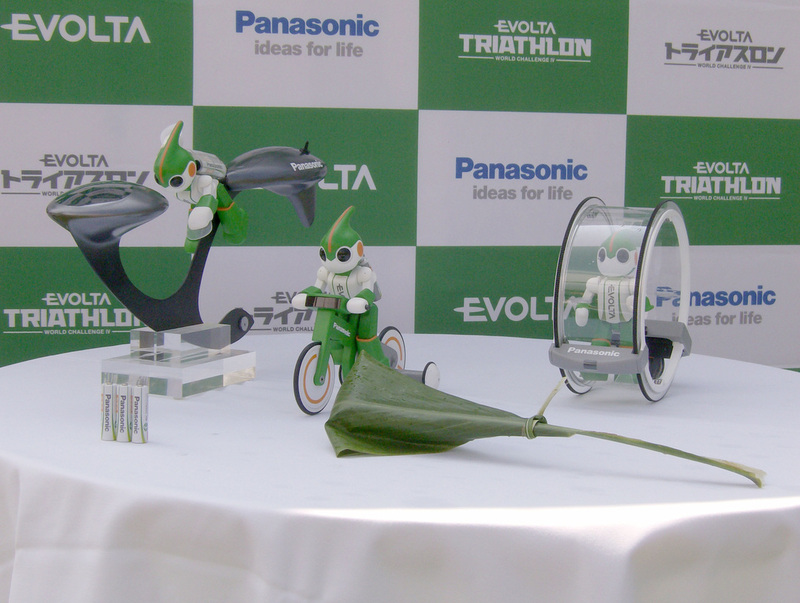 Evolta robots that participated in the 2011 Ironman Triathlon. Conceptualizing designs is one main factor towards creating robots. Stanford's Design Thinking Process is extensively applied to every robot we create. Using the design thinking process, we build robots and tools that are both efficient and safe. What is Stanford's Design Thinking process? The first step is empathy; we see how others feel towards specific item. Interviews are used to gain insight to human nature. The second step is to define. In this step, we use the information gathered from interviews to find the user's real problem. Ideate, the third step in Design Thinking, is where the group finds solutions to the problem. The fourth step is to prototype. Once an idea is decided upon, groups work together using random materials to construct exampled of their product and explain how their product works. Testing is the final step. Groups rebuild their prototypes and create a working product. once built. testing begins. Testing identifies problems with the item, so the product can be modified better to the user. Once all steps are completed, the cycle repeats to enhance the product. 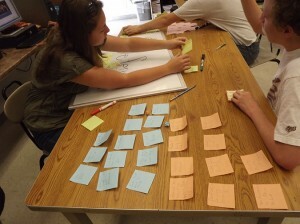 Students during a Design Thinking session. We take safety seriously. Every team member foes through Occupational Safety and Health Administration (OSHA) training classes to learn how to be safe. In 1970, Richard Nixon instituted the Occupational Safety and Health Act, creating the Occupational Safety and Health Act, creating the OSHA. Since the beginning of OSHA, the mortality rate at work has diminished. OSHA's goal is to have safe working environments and healthy workers. Why is OSHA Training important? to be safe in any hardworking environment and to identify hazardous areas, keeping everyone safe. The Tiki Techs currently hold a 100% college send off rate and we don't plan on stopping. So why no visit some of the top colleges in the United States of America and inspire kids to "Strive for the Summit?" Kealakehe Robotics VEX & FIRST Team 3880 from Kailua-Kona, Hawaii.